Some of you may have heard about the benefits of a Salt Cave or Salt Room. Halotherapy (Halo the Greek word for Salt), also know as Salt therapy, has many therapeutic benefits, including those that aide with respiratory illness, lung issues, allergies, and skin diseases. Although the benefits of salt mines or caves were first discovered in the mid 1800’s, and Europeans have sought out salt treatments since that time, Salt Caves are now beginning to gain trend and popularity in the United States and Canada for the numerous health benefits they offer. How does Salt Therapy Work? Salt particle are negatively ionized and have high levels of kinetic energy, allowing the particles to penetrate deeply into the lungs and airways. Because of salts healing qualities, those that experience this deeper level of penetration, receive the healing benefits salt offer. More and more salt therapy rooms or salt caves are beginning to open up across the U.S. and Canada. While recently visiting family in Fort Collins, I stopped into the Sanctuary Spa (www.fortcollinsspatreatments.com) and was able to have my first salt spa experience. Their salt room consists of 2000 lbs of Himalayan Sea Salt. I basked in salt for nearly in hour and came out feeling very stimulated, and awake. I did cough a bit more for the following few hours, but I was told that is a sign of a lot of mucus and it was healthy, the body’s way of eliminating what needed to be. Salt Therapy for Your Home. Now this site is about how we can bring day spa services and treatments to our home, without the need to travel to a day spa. I would like to give you a few tips on how you can create mini salt therapy sessions from the comfort of your home. 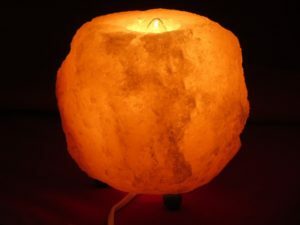 Salt Lamps are what we are going to recommend to purchase from your local store that carries them, or from Amazon. Do you homework to find a good one. Although Salt Lamps are not an actual whole room, we are going suggest how you can make a space in your home your own salt room with a few salt lamps. Salt Lamps in general can offer cleaner air and a more therapeutic space. Not only will you benefit from their healing aspects, but also from the soft glow that they put off to induce you into a sense of relaxation. A designate a space or one room of your home., your place for relaxation. Yoga mat, blanket, or bolster. Have your lamp/lamps plugged in. Options to Sit, lay down in a supine position (on your back), or support your mid back with the bolster in allow yourself to be in position that opens the front body. Place your eye pillow over your eyes (if you have one). Begin to focus in your breath, breathing in a little deep and slower than normal. Allow you exhalation to be nice and slow and long. If your might is trying to chase thoughts, let it be. Just try and not attach to those thoughts by focusing on your breathe. You will remain in this position for 20-45 minutes, depending on the time that you have. Try and do this 2-3x/week. After your session we suggest journaling for 3-5 minutes about your experience and how you feel. We hope you enjoyed your session!